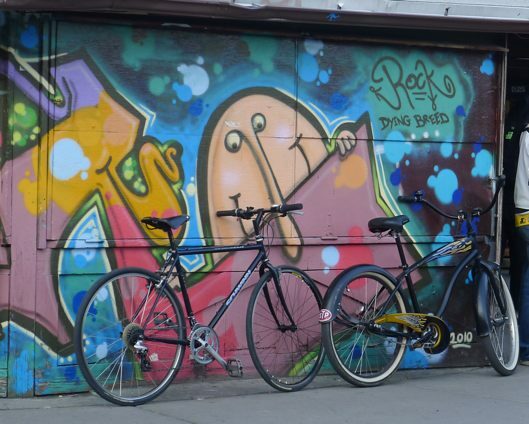 Toronto’s Kensington Market and bikes go hand in hand. Cyclists famously overtake the Market’s one-way streets, casually going in the opposite direction, against traffic. I admit, I’m one of those directionally challenged cyclists who wish cars were banned from the Market. I champion the idea of moving Kensington beyond Pedestrian Sundays (the last Sunday of the month, from May to October) to making the streets pedestrian-only boulevards every day, even if it meant I couldn’t bike those roads. As it stands, I usually can be found riding south on Augusta, staring down northbound drivers shaking their heads at me. Yet I’ve never locked my bike to this awesome, artsy bike stand at Augusta and College, in the north end of the Market. Coolest. Bike stand. Ever. Really, the Kensington bike rack tops my beloved City of Toronto post-and-ring bike stands. Not only does it spell out “Kensington,” its namesake neighbourhood, but it also resembles a bike chain! Kensington Market's Casa Acoreana Cafe, at the corner of Augusta and Baldwin, makes for an artsy backdrop for vintage bikes. Kensington Market is also a haven for Toronto cyclists because it houses Bikes on Wheels (BOW). The cute boys of BOW are always helpful, whether I’m having problems with my brakes or I need air or those little metal caps that keep the brake cable ends from fraying… It’s no wonder I spontaneously plunked down $53 for the Topeak RaceRocket mini bike pump, when I already had a portable pump and was in the middle of a 120 kilometre ride to Oakville and back. Perhaps I was distracted by the boys, ahem, I mean the boys’ friendliness. Likely I was lured by the high-end but affordable bike gear. I couldn’t help myself. Gear whore, here! Plus, Kensington is also home to Mike the Bike, a popular source for refurbished bikes, though I’ve never been able to find the storefront on Oxford Street near Spadina Road. Smart guy that Mike presumably is, he posts pics and deets of the bikes on his website, so people like me can find him online! Bike theft prevention is serious business.